I conceived the idea of “Men Who March Away” in 1992 shortly after the West End staging of “The Hunting Of The Snark”. I decided to write an original story for it; a love story set against the background of the First World War and the Spanish Civil War, ending just as the Second World War begins. Consequently the protagonists grow older and the story spans several decades and two generations. I had extensive discussions in the early nineties with Plymouth Theatre Royal with the intention that we would co-produce it. By then I had finished the book and most of the music and lyrics. We shelved the project at the time violinist Vanessa Mae was introduced to me and I wrote and produced her first and biggest (4m) selling album “The Violin Player” – which was a distraction that was welcome, but which took “Men Who March Away” of the diary, and led to its neglect for a number of years. It was only when I was invited by The Docklands Sinfonia to conduct them at St Anne’s Church in 2017, that I decided to complete the musical, finishing several songs that had been left incomplete, and orchestrating it for the full 70 piece line-up of the orchestra. What started out as an intended concert grew into a public workshop, fully costumed and almost fully staged. Allowances should be made for the ungraded, low budget filming of what was intended only as a workshop/concert. We are currently talking to various parties about mounting the show as a touring production. An epic musical love story by Mike Batt. 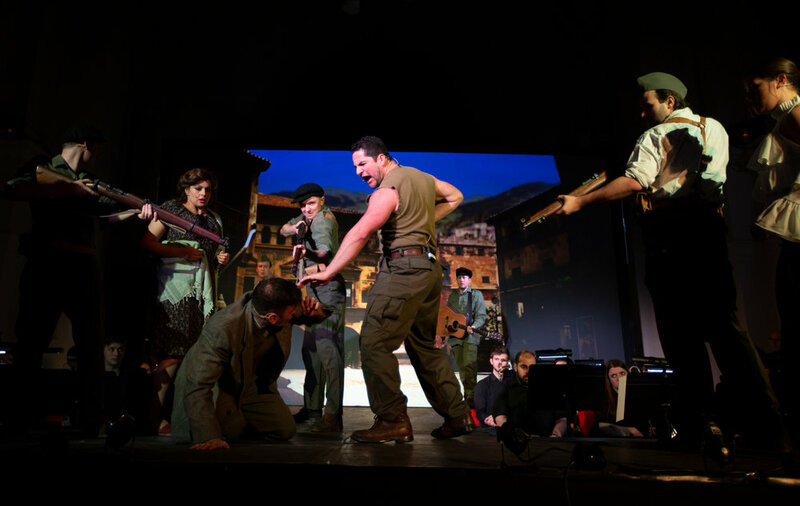 The background theme of the piece is the cyclical and endless nature of war, but the story is essentially a love story following the protagonists through the Great War, The Spanish Civil War and ending at the start of the Second World War. It’s a story of commitment, loss, personal sacrifice, stoicism and survival. The year is 1913. Katherine, (23) becomes engaged to Lieutenant George Denham. She defies her well-to-do parents and joins the music hall as (fake cockney) comedienne and singer, helped by George’s pal, Billy, - the rough diamond son of a wealthy East End merchant. He has become best friends with George at Rugby school, where he has received a knee injury precluding him from going to war when George does. When George leaves for the front, he leaves Katherine in Billy’s care and they develop their double act. As they become famous, ironically using a song that George has found for them in a Paris cabaret club, Billy and Katherine grow closer and a reluctant romantic relationship develops between them. On the night prior to the first push on The Somme, George returns on leave, as a surprise. Although she is aware of the growing relationship with Billy, Katherine is swept up in the moment and they make love. He leaves for the front the next day, and shortly thereafter Katherine is mortified to receive a telegram announcing that he is missing, presumed Killed In Action. Some time later Billy proposes to Katherine. They are married and a baby is born. Time passes and one night when Billy is away, Katherine is shocked when George reappears, having been severely injured but taken prisoner by the Germans. George is at first angry to learn of the marriage, and of the birth of Katherine and Billy’s son. On seeing the baby, he realises that it is clearly his own. Katherine requests that George should remain silent and allow the boy to grow up with Billy, her husband, as his father. Stoically, George agrees on condition that he is allowed to be the boy’s special uncle and Godfather. 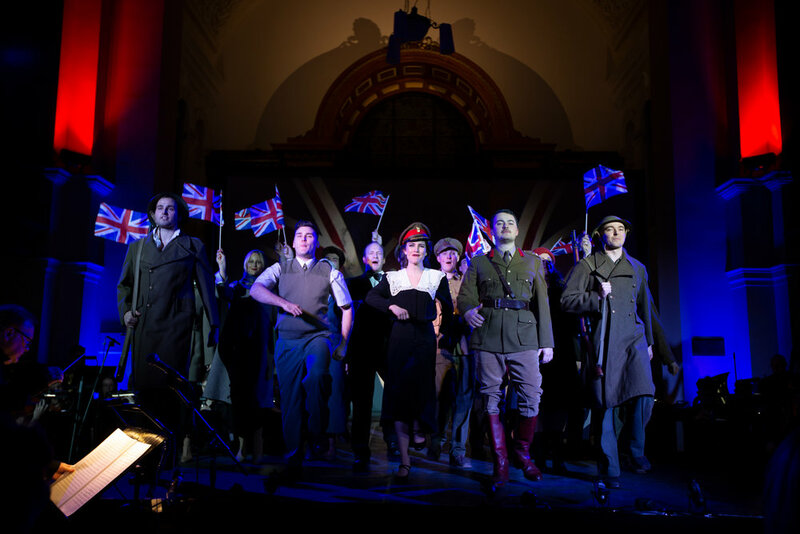 At the Armistice celebrations, George watches as the now famous Billy and Katherine sing and celebrate. He has lost his fiancee and his son to his best friend. It is a Sunday in 1936. 46-year-old Katherine and Billy are well known stars of the wireless, and have their own Sunday lunchtime show. George, now a Brigadier, (who has stayed in close touch as was agreed) arrives to drive them to the studio, as Billy is drunk and incapable – he is an alcoholic. Katherine and Billy’s 19-year-old son Matthew defies his parents and leaves for Spain with two friends to join the International Brigades against Franco’s fascists. Arriving in Arganda, Matthew is taken prisoner by the very troops the boys have come to join, as they cannot prove their identity. These troops are led by ruthless militia captain Vincente. The other boys escape and return to break the news to Billy and Katherine. The boys arrive back on a night when Billy is drunk, but George and Katherine are returning to the house from a senior officer’s ball where, still friends, they acknowledge that they must never allow their relationship to go any further than that. Billy announces that he is going to Spain to plead for Matthew’s release. George says it would be better if he, with his military background, should go. There is a fight between them. Billy punches George to the floor and leaves for Arganda. In Spain, he is a fish out of water. He is politically unsophisticated and doesn’t know the difference between the two sides in the war. Just after a fascist attack on Arganda (where Matthew has been now released to fight for the Republicans, and, with them , driven out of the town to the cemetery on the hill nearby) – Billy runs into fascist troops but jokes and juggles his way out of trouble. He leads them in song that night, and sleeps in the very barn that Matthew had been a prisoner before the town was routed. Realising that he has joined the “wrong side”, and that his son is probably up on the hill with the Republicans, he gets up very early the next morning and, wearing a blanket given to him the previous night by the fascists, heads for the cemetery to try to find Matthew. He is shot in the arm by Vincente’s defending Republicans but makes it to their lines with a makeshift white flag. Unable to pass a test to prove his identity he is shot dead at point blank range by Vincente. Just then, Matthew arrives on the scene and discovers his father’s dead body. Back in England, Matthew relates the story to Katherine and George. The loss is tragic and emotional. Time passes and George and Katherine, having told Matthew of his true parentage, are finally married. As they sit down to lunch one day, listening to the wireless, the voice of Neville Chamberlain announces that Britain is once again at war with Germany. The two men stand, and the scene freezes. Are they just clearing the plates or leaving to go to war? Katherine sings the troops off in true Vera Lynn style.